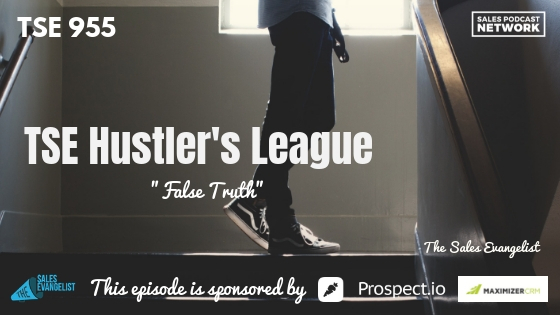 TSE 955: TSE Hustler's League - "False Truth"
All of us confront fears that hold us back and prevent us from being really successful at sales. One of the biggest is the fear of rejection, and it’s one of the first lessons we’ll review in The Sales Evangelist Hustler’s League when we begin our new semester in January. On today’s episode, we’ll discuss how false truth contributes to the fear of rejection. The fear of rejection and the anxiety that results from it cripple many people. It affects their business life, their personal life, their dating life, and their sales life. It originates from a belief that someone or something is likely to cause us harm or pain. If we don’t address it, it grows. For me, my claustrophobia was partly rooted in a TV sitcom with fictional characters who got stuck in a fictional elevator. In my mind, if the people on the elevator could get stuck, then I could get stuck. As a sales leader, if the people on your team are afraid of rejection, what happened in their lives that led them to that point? Is it true that sometimes people won’t be interested? Yes. But that doesn’t mean they are rejecting you as an individual. Sales reps who fear failure avoid sending emails and making phone calls. The truth is that nothing will happen for those sales reps until they make contact somehow. They will continue fearing that people will reject them so they will make excuses about why they aren’t communicating. They’ll keep running in circles. Researchers set out to prove that some of our fears are based on “false memories,” or situations that we choose to remember differently than the way they actually happened. They convinced study participants that they had become ill after eating egg salad. Then, they offered the subjects four sandwiches, and none of them chose the egg salad. 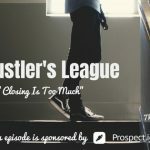 We begin TSE Hustler’s League by recognizing the fears and trying to determine whether they are actually based in fact. Even when they are justified, they often result from a one-off situation. It absolutely isn’t true that every single time you call to speak to someone, that person is going to reject you. When I realized that my fear of elevators was unfounded and based in false memories, I went on an elevator. I didn’t get stuck and nothing bad happened. It helped me move forward. I’m a big believer that you must take action. Ralph Waldo Emerson says “That which we persist in doing becomes easier…” It isn’t that the nature of the thing changes, but our ability to do it actually improves. If I ride an elevator despite my fear of getting stuck, it gets easier to ride the elevator. Psychologically, it gets easier for me to do it. Sellers must pick up the phone and reach out to the prospect. They must send emails and LinkedIn requests. If sellers do that, they’ll see that they won’t get eaten alive. The prospect isn’t going to yell at you or come after you. Even if they do say no now, they might say yes later. Without realizing it, we get hung up on only one possibility and we never consider the other options. Instead of only imagining that things will go wrong, we should consider the possibility that things could go right. If you never move beyond the fear, the fear worsens and it affects your work. If you offer it and they say no, what’s the worst thing that happens? You move on to the next person. Once you’ve been rejected once or twice, you realize that it’s not fatal. As you move through the fear, you develop a confidence that helps you become even more successful in your career. 1. This fear is in your head. 2. It could be the result of a false memory. If you discover a fear that’s paralyzing you, do something about it. Do it over and over. It becomes easier to send an email to a prospect once you’ve done it a time or two. Same with LinkedIn messages or phone calls. The more you do it, the more you’ll stifle the fear. You’ll move closer to accomplishing your dreams and desires and you’ll stop missing out on things because of fear. If I had let my fear of elevators control me, I would have missed a chance to visit the World Trade Center during a school trip. What regrets would you have if you never overcome your fear? What business could you start? Could you close a sales opportunity? Read more about the fear of rejection and how it manifests itself in our daily lives.